I’m back at it - and bringing you a review of the new Strathberry East/West Bag in bottle green with silver hardware! Strathberry is a new brand for me. The first time that I learned about Strathberry was when the Duchess of Sussex Meghan Markle wore the mini version of the East/West bag with gold hardware (see photo here). Not surprisingly, the bag in various colors sold out overnight after she wore it. I’ve been waiting patiently for months for this color to be restocked. I was SO delighted when I received an alert at the end of October saying it was available in the bottle green color and with silver hardware. Of course, I ordered it immediately! I ordered the Strathberry East/West Bag directly from the Strathberry website. I found the website easy to navigate and reviewed all of their styles and colors. Check out was a breeze. The company is based out of Edinburg, Scotland but their products are handcrafted in Spain. All of their goods ship from the UK and was glad that shipping to the US was complementary (for purchases >$300). This bag arrived in record time - 4 days (and that included crossing the Atlantic Ocean!). The handbag came in a black box with gold lettering. A single “Thank You” card at onto of black tissue paper. Underneath, the bag was held in a black dust bag and liner. 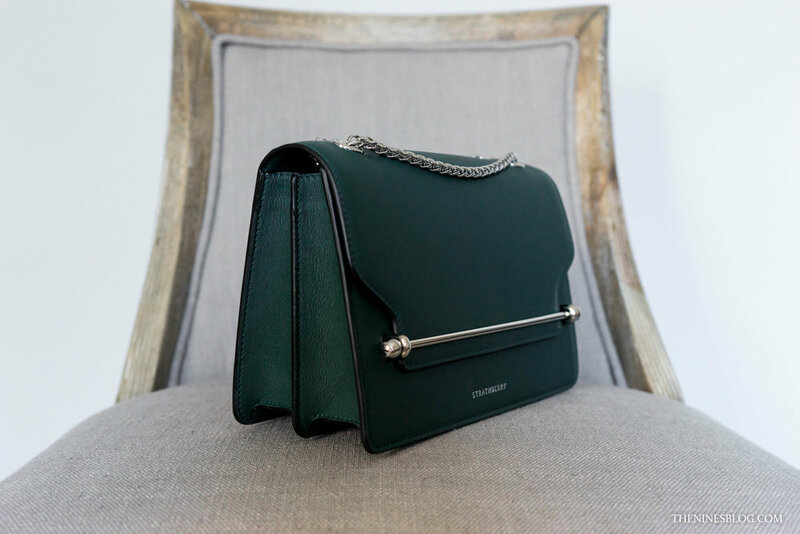 Strathberry’s take on the flap bag is a winner in my book! It has a classic look but also many wonderful details that make it worthwhile to own. The stand out feature is the signature “Strathberry bar closure”. The bar hardware with rounded ends adds dimension and makes it feel elegant and modern. 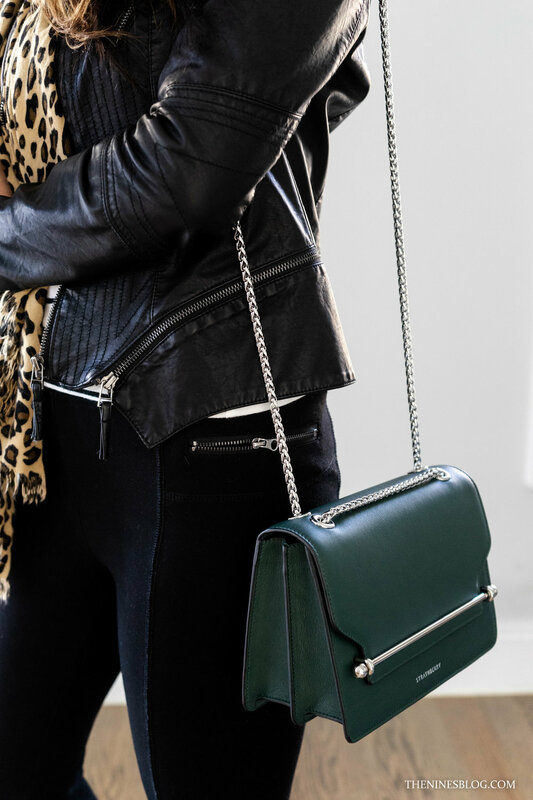 This styling makes it unlike any other flap bag out there. The flap is secured with strong magnets embedded inside the bag so the bar closure is really just for decorative purposes. The chain straps feel study and have a decent weight. However, it feels less substantial when compared to the chains on a YSL Kate flap bag or Chanel flap bag. The East/West bag is made out of a soft, supple genuine leather. 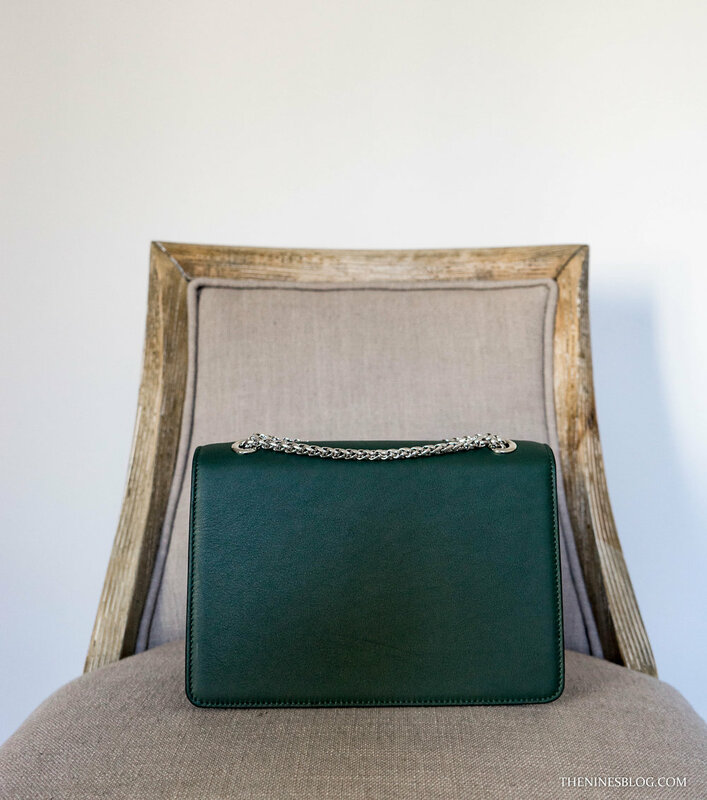 This bottle green color comes in the smooth leather only. Strathberry also offers embossed leather in a croc-style pattern in other colors. The accordion profile is also an interesting design that starts wide at the base that narrows at the top. Beige micro-fiber lines the interior of the bag, it feels like suede. There are two main compartments which allows for plenty of space and organization. I personally like bigger handbags (and avoid WOCs) as I am incapable of packing light. The East/West bag easily accommodates my iPhone, card holder, lipstick, lip balm, keys, spare battery, and charging cable (and space to spare). There is also one card slot and the Strathberry logo along the back. There is a trade-off when it comes to soft leather - it’s prone to scratching. I have long nails so I have to be extra careful to not dig into the leather when grabbing the flap. Strathberry hand-paints the edges by hand so the application isn’t 100% even. My bag has a noticeable blob of paint along one of the accordion profile edge. The bar closure “clinks” against the hardware hooks/holders (that hold the bar in place) every now and then. It’s not a big deal for me but some may mind. The chain length is generous. When worn as a single strap, it has a 21in shoulder drop and when doubled up, it has a 11.5in shoulder drop. My favorite way to wear this bag is with both straps! It sits comfortably by my waist and feels secure there. For a bag that has some girth, tucked under the shoulder and close to the body is the best position. The chain is bit long for my 5’4” frame when worn with a single strap. It hits me mid-thigh and noticeably swings when walking. Overall, I’m really enjoying this bag. So YES, I would buy this brand again. I’ve received several compliments on it and people stop me on the street to ask me about it. It looks luxe and has an attainable price tag. The bag works great for me on my weekends running errands or exploring the streets of Boston . It weighs less than 2lbs so it is easy to carry and opens/closes without issue. This bottle green option currently retails for $700 USD. Depending on the color and design, this sized bag can range from $700 - $810. Do you have a Strathberry handbag? Let me know how you feel about the brand and if you’ll be shopping it in the future!